The natural face-lift How to look beautiful forever with only face exercises. Fitface, with over 300 pages, 70 photographs and 60 hands free face exercises is packed with the essential information you need to know about how to tighten sagging skin, smooth wrinkles, eliminate folds, build collagen and elastin. This giant book shows you "how to" get a fabulous fit toned face - fast, that lasts forever, in just 15 minutes a day without any risk, expense or pain. Cosmetic surgeons agree that tight facial muscles are the most important part of looking good. It's not your skin that sags, but that, over time your muscles become slackened - tighten them with Fitface - as a result your face will lift naturally. The knife only shortens and weakens muscles, needles just paralyse and temporarily plump muscles, expensive creams are superficial - only Fitface works on both the issues of your muscles and skin tone. Skin grows from the inside out. Facial exercises increase circulation thus sending more oxygen and essential nutrients to your face, which builds collagen and elastin - naturally rejuvenating your skin tone, making you glow. Fitface exercises are 'hands free', the only facial exercise system that does not put any pressure on the skin, thus avoiding damaging delicate facial tissues. 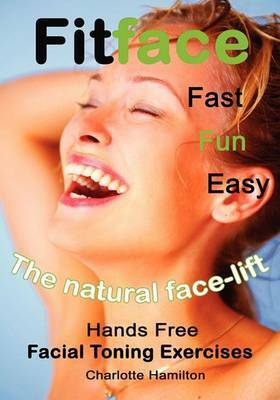 Fitface is the only natural face-lift that truly is the alternative to needles or knives. Fitface carries no risk, no pain, no scarring or complications and no recuperation time. It is the new greener and kinder option to staying beautiful forever. Dr. Christian Jessen - plastic surgeon and a TV personality (July 2010) warns of the risks of cosmetic surgery in THE UGLY FACE OF BEAUTY. "1 in 5 are more miserable after surgery than before." Start facial exercises today for a younger looking tomorrow. The author of Fitface, Charlotte Hamilton has been an advocate of face exercises for over 20 years. She "talks to the reader" sharing her first hand knowledge of witnessing a botched face-lift and how a team of plastic surgeons saved her daughter's face and life. This makes Fitface very honest, readable a truly unique book endorsed by extensive research referenced with more than 60 pages.